Brandon Bollig has already had some of his biggest childhood hockey dreams come true. Recently, the Stanley Cup winner, through the NHLPA’s Goals & Dreams fund, helped members of the St. Peters Spirit Hockey Club realize theirs. Bollig, a former member of the St. Louis-area Spirit, was humbled by the news that St. Peters will receive a donation of 50 sets of new equipment. Through St. Peters’ Learn to Skate and Try Hockey for Free days, almost 200 kids are introduced to the game each year. Bollig has certainly not forgotten his hockey roots. The 27-year-old brought the Cup back to his home state, a visit that included stops at St. Louis Children's Hospital, the Arch and Busch Stadium. The trip ended at St. Peters Rec Plex, where Bollig's hockey career started. Traded to Calgary on June 28, Bollig is embracing the opportunity to contribute to a Flames squad looking for playoff success. The two have never met outside of the rink, but they did drop the gloves in a spirited tilt last November. It ended with Bollig giving his new teammate a playful pat on the head. Bollig’s most difficult challenge in changing jerseys might be in convincing others to switch allegiances to his new club. 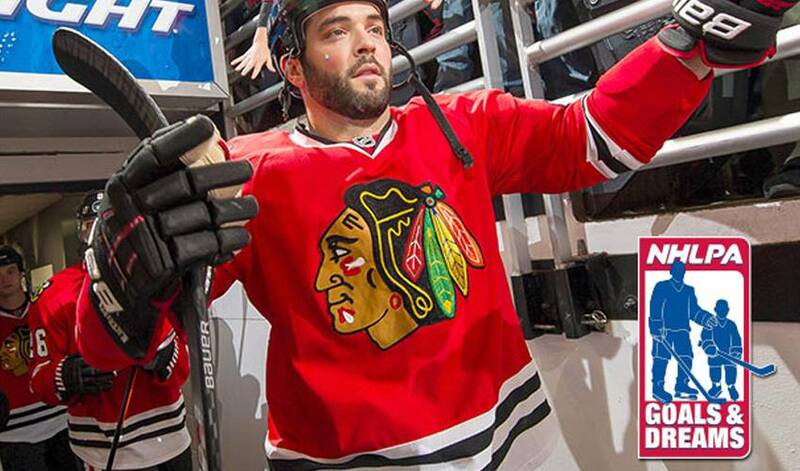 Bollig will face his old team on October 15, when Chicago hosts Calgary at the United Center. In 1999, the NHLPA launched the Goals & Dreams fund as a way for the players to give something back to the game they love. The players’ program has donated full sets of hockey equipment that has benefitted more than 60,000 economically challenged children in 32 countries and assisted with upgrades and the building of hundreds of arenas world-wide. To date, Goals & Dreams has donated more than $22-million to grassroots hockey programs around the world making it the largest program of its kind. Click here for more on Goals & Dreams.